Norovirus is a highly contagious virus that can infect anyone. It is spread when people touch surfaces or objects that are contaminated, or have contact with someone who is infected. For example, it can be acquired if you use contaminated utensils that were not properly disinfected. Norovirus spreads particularly quickly in group environments, such as daycares or nursing homes. 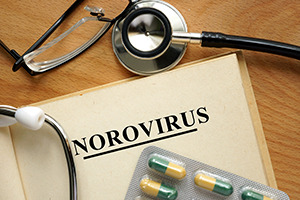 If you suffer ill effects from norovirus or another form of food contamination, you should consult the experienced norovirus lawyers at Moll Law Group. Billions of dollars have been recovered in cases in which we were involved. Norovirus is found in an infected person's stool even before he or she starts feeling symptoms and may stay in the stool for two weeks after feeling better. Symptoms usually develop within 12-48 hours of exposure and last 1-3 days. Some of the most common symptoms of norovirus are stomach pain, diarrhea, nausea, fever, headache, body aches, and vomiting. It can also cause gastroenteritis, which is an inflammation of the stomach or intestines. In small children, there is the possibility of dehydration, which includes symptoms like decreased urination, dry mouth, sleepiness, fussiness, and dizziness. Norovirus can be serious, particularly for young children. If you or your child suffers serious symptoms from norovirus, you may bring a food contamination claim with the help of a norovirus lawyer against the manufacturer or another entity in the chain of distribution for the product that carried it. You need to prove that the defendant either made, shipped or served the contaminated food or other product harboring the norovirus, the defendant caused the contamination or did not use reasonable care to stop it, you consumed the food or used the utensil or other product that carried the virus, you suffered an illness because of consuming it, and a doctor diagnosed you with norovirus. Food contamination claims are essentially product liability claims, and you can use the same theories when suing for norovirus injuries that you would in a defective product case. These include strict liability, negligence, and breach of warranty. In a negligence case, for example, you need to show that the defendant caused you to become infected with the norovirus by failing to use reasonable care, thereby causing your damages. For example, if a fast food restaurant fails to wash the area where trays are kept, and the trays carry norovirus, it has likely breached its duty to use reasonable care. Since there is a short window of time within which norovirus is contracted, it should be possible to narrow down where the contamination occurred. However, many people eat at multiple food establishments during the week, and it is possible that the defendant will argue you were made sick elsewhere. It can help to check with public health authorities to see if there has been an outbreak in a particular establishment. In strict liability cases, you need to prove that food or utensils were made unreasonably dangerous due to norovirus, and this caused your injuries. In a strict liability case, the defendant cannot defend on the grounds that it used reasonable care. If you are made sick by norovirus, you should consult the experienced product liability attorneys at Moll Law Group. We provide aggressive legal representation to consumers around the nation, including in states such as California, Florida, New York, Pennsylvania, Texas, Ohio, and Michigan. Call us at 312-462-1700 or use our online form to set up a free consultation with a norovirus attorney.